fields is happy to present the release of our fifth issue, and it's our biggest one yet: 220 pages of interviews and profiles with up-and-coming writers, artists, and musicians, including poets Mira Gonzalez, Ji yoon Lee, Julia Lans Nowak, and Jayson P. Smith; author Antonio Ruiz-Camacho; artists Caleb Hammond, Ellen Nielsen, and Rand Renfrow; and musician Owen Ashworth (Casiotone for the Painfully Alone, Advance Base). It also features a 28-page portfolio of work from the studios of Afrofuturist artist Angelbert Metoyer, and a collection of sumi ink drawings from local artist Greg Piwonka, whose work is featured on the cover. The issue features poetry, short stories, and artwork from a variety of artists from Austin and around the globe. 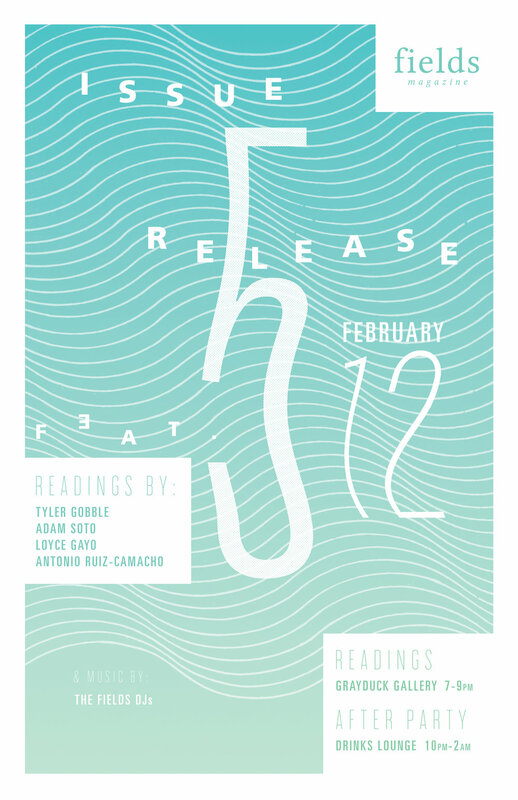 To celebrate, we are hosting readings with four of our favorite local writers: Tyler Gobble, Adam Soto, Loyce Gayo, and Antonio Ruiz-Camacho, all of whom have been featured in fields. Gobble's poetry and Soto's short stories can be found in issue 5, alongside an interview with Ruiz-Camacho, whose debut collection, Barefoot Dogs, was one of Kirkus Review's Best Books of 2015. And readers may remember our interview with Loyce Gayo from our fourth issue; we are honored to finally get to host one of her powerful performances. The event will be held at grayDUCK Gallery, located at 2213 E. Cesar Chavez. Doors open at 7, and readings will start at 7:30. Drinks wil be provided. Seating is limited, so guests are encouraged to arrive early! Following the readings, fields staff members will be DJing an afterparty down the street at Drinks Lounge (2001 E. Cesar Chavez St.) from 10-2. So come on out and enjoy lively readings and music, and snag yourself a copy of our fifth issue. We hope to see you there! Tyler Gobble is currently a poetry fellow at the Michener Center for Writers. Alongside Jennifer Whalen, he hosts Everything Is Bigger, a reading series in Austin, Texas. His first full-length collection, MORE WRECK MORE WRECK, is available from Coconut Books. He prefers disc golf, sleeveless shirts, porches, and bacon. More at tylergobble.com. Adam Soto is a musician, writer and teacher living and working in Austin, Texas. He has an MFA in fiction from the Iowa Writers’ Workshop and his work appears or is forthcoming in Versal Journal and Glimmer Train. He keeps a story/music blog called everythingintheskybelongstoyou.com and his twitter is @adjoso. He is currently working on a novel. Loyce Gayo is a Tanzanian-born slam poet, singer/songwriter, and activist who currently resides in Texas. Gayo is profoundly influenced by her experience in the diaspora and uses her craft to celebrate the journey of a people dispersed. She also uses her voice to advocate for the empowerment of marginalized people by supporting local efforts and organizations. Gayo serves as an alumni of the TheySpeak Austin Poetry Slam team and the collegiate poetry slam, CUPSI, 2014 National Champions. Gayo is pursuing a degree in African and African diaspora studies with a certificate in social entrepreneurship and nonprofits at The University of Texas at Austin. Antonio Ruiz-Camacho (b. 1973, Toluca, Mexico) is the author of the debut story collection Barefoot Dogs (Scribner, March 2015), named by Kirkus Reviews as one of the best books of 2015. The paperback edition (from Scribner) and the Spanish edition (from Vintage Español) will be released on March 22. His work has appeared in The New York Times, Salon, Texas Monthly, and elsewhere. A former John S. Knight Journalism Fellow at Stanford University and a Dobie Paisano Fellow in fiction by The University of Texas at Austin and the Texas Institute of Letters, he earned his MFA from The New Writers Project at The University of Texas at Austin. He lives in Austin with his family, where he's currently at work on a novel.